Peter Capaldi’s Twelfth Doctor may be leading the charge on Doctor Who nowadays, but the show hasn’t forgotten about the adventuring Time Lord’s past. The show is still bringing in characters from his previous regenerations, including Jenny, Vastra and Strax (a.k.a. the Paternoster gang), UNIT Chief Scientific Officer Kate Stewart, Kate’s assistant Osgood and the new Master. Today we’ve learned that an especially important person from The Doctor’s past will return for the Christmas special later this year after a two year absence: Professor River Song. The BBC announced today that Alex Kingston will reprise her role as The Doctor’s time-crossed wife for the 2015 Christmas special. No details were provided on the special’s plot, but this will be the first meeting between the two characters since The Doctor regenerated in the 2013 Christmas special “Time of the Doctor.” The special, which began filming earlier this week, is being written by Steven Moffat, produced by Nikki Wilson and directed by Douglas Mackinnon. This isn’t the only Doctor Who project that Kingston is returning for. She will also voice River for two Doctor Who radio dramas being released next year featuring Paul McGann’s Eighth Doctor. River Song was introduced in the Tenth Doctor episodes “Silence in the Library” and “Forest of the Dead” as a mysterious woman who knew The Doctor quite well, but who he had never met before. Although River perished at the end of the two-part adventure, David Tennant’s Doctor was able to preserve her consciousness into a supercomputer at the last minute. However, thanks to the wonders of time travel, she went on to be a major recurring character during the Eleventh Doctor era, as Matt Smith’s Doctor went on adventures with younger versions of her. 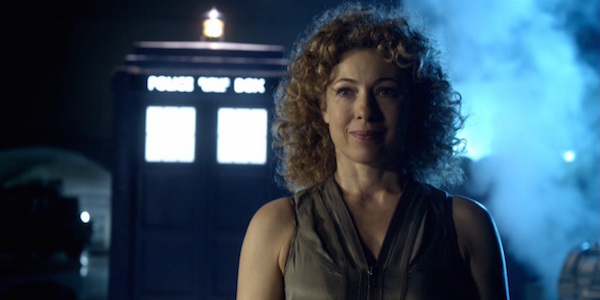 River’s last appearance was in the 2013 episode “The Name of the Doctor,” where her consciousness assisted the Eleventh Doctor and Clara on Trenzalore. Look, this is a very timey-wimey relationship, so no one would blame you for perusing the internet for more information. River and the Eleventh Doctor had a flirtatious relationship during their time together. However, one of the side effects of regeneration is a changed personality, and as we’ve seen so far, Twelve is not one for romance, so expect to see a radically different dynamic between the two (though that’s not to say Capaldi’s Doctor doesn’t still care for her). The more important concern, however, is which version of River the audience see in the Christmas special. Will it be a younger version of the character? Will it be her consciousness from the supercomputer? Or will it be another unusual phenomenon that brings them together? As was the case with River’s past during the Eleventh Doctor era, it’s a big mystery. The next Doctor Who Christmas special will air on Christmas Day, but before that, you can catch Season 9, which premieres on BBC America in the US (and BBC One in the UK)on Saturday, September 19.